This sectional is a wonderful addition to your home. 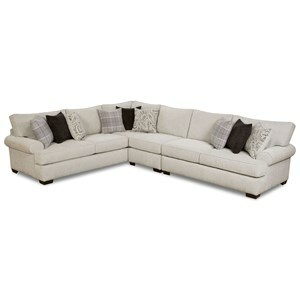 This piece has loose back pillows with welt cords, ultra down seat cushions with welt cords, track arms, and block legs. This piece includes at least four 19-inch throw pillows. You can customize this piece by choosing from multiple leathers and fabrics. The 7164 4 Seater Sectional with Track Arms and Block Feet by Huntington House at Thornton Furniture in the Bowling Green, Alvaton, Glasgow, Scottsville, Franklin area. Product availability may vary. Contact us for the most current availability on this product. 7164-52 Right Arm Chair 1 42" 45" 36"
7164-51 Armless Chair 1 40.5" 45" 36"
7164-31 Wedge 1 45" 45" 36"
7164-43 Left Arm Loveseat 1 82.5" 45" 36"